Four heritage train journeys are the centerpiece of this Adventure, the most impressive starting across the New Mexico border and topping out at over 10,000 feet above sea level. Traveler Rewards Program: New Travelers receive a $200 discount on the Colorado by Train tour! 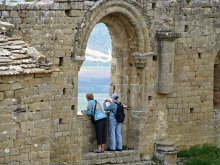 Returning travelers receive our Alumni Traveler Discount of 5-10% off the main tour price. Terms, exclusions and conditions apply. Check out our Traveler Rewards page for more details. Now accepting Early Bird deposits on this 2020 tour! An Early Bird is a $50 deposit that holds your spot during the planning stages of a trip, when we don’t have a set itinerary or dates. Early Birds are always refundable! Following the rousing success of our past Colorado by Train Adventures, we have been anxious to get back to the radiant Rockies. We are now pleased to offer a fifth rendition of this outstanding itinerary, which includes a high-quality combination of great walks, vintage train rides, and spectacular scenic driving through the awesome alpine panoramas of Colorado! Starting and finishing in Denver, this 11-day program uses a combination of a motorcoach and four vintage trains to work our way through the “Centennial State” amongst a smorgasbord of some of the country’s most scenic settings! Immersing ourselves in almost non-stop Rocky Mountain panoramas, from the splendor of the 14ers (peaks higher than 14,000 feet), to the depths of Black Canyon of the Gunnison National Park, to the towering waves of sand at Great Sand Dunes National Park. This is a draft itinerary. Revisions will be made, and an updated itinerary with dates and pricing will be made available! Pricing is based on double occupancy. A limited number of single rooms are available for a supplement. We also provide a roommate matching service. More fun stops than we can list! Discounts available. See the More Details section for info. How much Adventure do you want? Here are a few features to help gauge the following factors on each tour. Tour Pace: On a scale of 1 (slowest pace) to 5 (fastest pace), we’ve rated the following factors: number of 1-night hotels; driving miles per day; fullness of schedule; mid-tour airline flights; high elevation setting; and average amount of walking per day. Walk Challenge: This number represents an average walk difficulty rating for the tour using a scale of 1 (easiest) to 5 (hardest). 13 meals: all breakfasts, 1 lunch, and 2 dinners as denoted by (BLD). Not included. Official start and finish is in Denver, Colorado (airport code DEN). Included. With 4 heritage train journeys and motorcoaches with a seating capacity of 40 seats. Our travelers usually range from 50–75 years of age. All ages welcome! Click on each day for more details. Our vintage train Adventure through the celebrated Rocky Mountain vistas of Colorado begins today in Denver. Travelers arrive throughout the day. Our first official activity is the Welcome Orientation & Reception this evening at 7:30 pm at our hotel. Please plan to arrive in time to attend this important Adventure kick-off! We head west into the Rockies today on scenic Interstate 70, bound for the tiny town of Silver Plume and our first vintage train experience. The Georgetown Loop Railroad was built in the 1880s to connect the gold and silver boom towns of Georgetown and Silver Plume. The “loop” covers 3 miles of narrow-gauge track with an elevation gain of 640 feet, requiring a series of trestles, cuts, and loops. We disembark for a walking tour of the historic Lebanon Silver Mine at the halfway point. After lunch on our own in Victorian-styled Georgetown (8,512 fasl – feet above sea level), we soak up the wild west ambiance of Hotel de Paris, then continue over the continental divide through dramatic mountain scenery to the quiet little town of Carbondale. Nestled in the eye-popping San Juan Mountains, Ouray (7,811 fasl) warrants a full day to explore its lovely alpine surroundings. A morning walk around this charming, 19th century mining town blends Victorian-era homes, rushing waterfalls, and endless mountain panoramas, plus a likely bonus of colorful fall foliage. Or soak in the famous Ouray Hot Springs near our hotel before enjoying dinner on your own in this delightful destination. After a nostalgic morning visit to the well-appointed Ouray County Museum, we ascend the Million Dollar Highway, touted by the American Automobile Association (AAA) as “among the nation’s most spectacular automobile routes.” This jaw-dropping road leads to another mining Mecca – the aptly-named town of Silverton (9,305 fasl). Here, we board the Durango & Silverton Narrow Gauge Railroad, built to transport gold and silver ore in the early 1880s. Mining gave way to tourism, however, and the magnificent vistas through which it is routed resulted in a steady stream of visitors through 128 years of continuous operation. We arrive in Durango (6,502 fasl) this evening for a two-night stay. Mesa Verde National Park is the only American national park dedicated specifically to human endeavors. Our multi-part walk in the park introduces us to the Pueblo Indians who first arrived in this area more than 1,000 years ago. The route also highlights the natural beauty of the park, exploring several of the impressive Pueblo cliff dwellings the park was established to protect. Following a recurring theme, the transport of silver ore from southwest Colorado’s San Juan Mountains was the objective for building the Cumbres & Toltec Scenic Railroad during the 1880s. 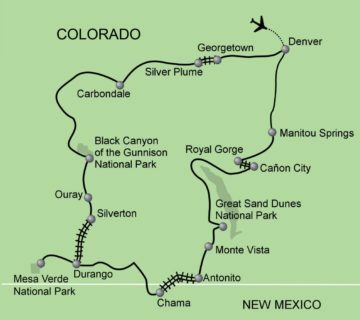 Our third train journey follows a 64-mile narrow gauge line through the spectacular mountains and valleys of northern New Mexico and southern Colorado. We board in Chama, New Mexico, travel as high as 10,015 feet above sea level, and ride, at one point, on rails fastened to a rock shelf carved from the face of a cliff. The train stops midway for a hot lunch before continuing to Antonito, our destination back on the Colorado side of the border. We spend the night in the small community of Alamosa (7,543 fasl), enjoying dinner on our own in the shadow of the Sangre de Cristo Mountains! Great Sand Dunes National Park takes us into another world – 30 square miles of sand dunes rising to heights of nearly 700 feet! A short nature trail takes us up close to this phenomenal sea of sand surrounded by the Rockies, with an option to climb to the breathtaking summit of these surreal dunes. Following a picnic lunch on our own at the base of the Sangre de Cristo Mountains, we journey to Cañon City (5,332 fasl), the gateway to the Royal Gorge, and our home base for the evening. Mining in the 1880s was again the motive for what became a railroad war between the Denver & Rio Grande Railroad and the Santa Fe Railroad. The two companies waged an ongoing struggle of litigation and armed confrontation for the right to build and operate a railroad through this deep river gorge. Sheer gorge walls over one thousand feet tall, in places, required that rails be suspended over the river for several hundred feet. Our seats are in the 1950s Vista Dome, the best way to take in the breathtaking views of the Royal Gorge. We arrive early afternoon into Manitou Springs (6,320 fasl). Faster walkers may have time to walk the local volkswalk; others may wish to just stroll amongst the artsy charm of historic Manitou Springs. Our final walk regularly ranks high in the Top 10 voting for best Volkswalks in the country. At the base of Pikes Peak, this trail winds through the towering red sandstone monoliths of the Garden of the Gods. Following lunch on our own at the park’s Trading Post, enjoy free time during the afternoon in Manitou Springs. We rendezvous this evening to reminisce about our journey at a Farewell Dinner. Our Colorado by Train Adventure draws to a close with an early-morning group transfer to the airport in Denver. Exploring the beauty of the Rockies is a delight. Combining the Rockies with travel on these wonderfully restored and maintained historic trains makes this experience unforgettable. Thanks for sharing this nostalgic connection with America’s past! Click on each heading for more details. How do I lock in my place on this Adventure? Now accepting $50 Early Bird deposits on this 2020 tour! We’ll take 24-28 travelers on this tour, with 2 guides accompanying, offering a guide to traveler ratio of 1:14. What’s an Early Bird? Early Bird deposits are refundable $50 deposits which serve to hold your spot on this tour until dates and pricing have been confirmed. Once all details on this tour have been finalized, travelers can then register with an additional $450 deposit to bring their total on this tour up to $500. New Travelers receive a $200 discount on the Colorado by Train tour! Returning travelers receive our Alumni Traveler Discount of 5-10% off the main tour price. Terms, exclusions and conditions apply. See the Traveler Rewards page for more details or contact us with any questions at 800.779.0353 or [email protected]. The official start and finish point for this Adventure is Denver, Colorado (airport code DEN). We recommend that you contact Laura Pfahler, the travel agent we work with, to help book your flight arrangements. In this age of airfare complications and airport uncertainty, using a travel agent is a good investment! More details about flight arrangements and travel agent contact information will made available after this itinerary has been finalized. Two optional excursions are available during this Adventure: Downtown Denver Highlights Excursion & Walk (Price TBA) and a Rocky Mountains Jeep Tour (Price TBA). We generally walk at a pace of 2 to 3 miles per hour. In most cases, we are not “strolling.” We are walking at a relaxed but steady pace. Your experience will be significantly affected by your level of physical fitness. Because these are guided group walks, the success of the walks is predicated upon walkers having this minimum level of fitness in order to ensure that we are walking at a somewhat similar pace. If not walking regularly at home, we strongly recommend that you make a priority of “training” beforehand in order to both enjoy the trip and avoid medical issues due to overexertion. If you have questions about your ability to participate, please talk with our office at 1.800.779.0353. 1. Very small hills or very little stair climbing. Cumulative elevation gain from Starting Point: up to 200 feet. 2. Some moderate hills and stair climbing. Cumulative elevation gain from Starting Point: 200-1000 feet. 3. Some significant hill or stair climbing. Cumulative elevation gain from Starting Point: 1000-2000 feet. 4. Lots of significant hills or stair climbing. Cumulative elevation gain from Starting Point: 2000-3500 feet. 5. Many steep hills. Cumulative elevation gain from Starting Point: more than 3500 feet. A. Almost entirely on pavement. B. A significant part of the route is on well-groomed trails with very few obstacles. C. A significant part of the route is on somewhat difficult terrain (rocky / rooted paths or soft sand). D. A significant part of the route is on very difficult terrain. E. The majority of the route is on very difficult terrain. Please bear in mind that the walks on this Adventure take place at elevations ranging from 5,000 feet above sea level to well over 8,000 feet above sea level. It is important to pursue any concerns you have about altitude with your doctor. As always, travelers are free to opt out of any activities. However, acclimation to these altitudes is an important aspect of a successful visit to the Colorado Rockies for most of us who live near sea level. As is the case with all of our Adventures, it is also important that you prepare for the fun by maintaining a good physical fitness routine. We are currently developing the itinerary for this Adventure. Once the itinerary is released, we will accept registration deposits ($500) to save space. If you have Early Birded with a refundable $50 deposit, your spot on the tour will be held for 2 weeks after the itinerary is published while you make a decision on whether or not you’d like to register with an additional $450 fee, bringing your deposit on tour up to $500. If you decide not to join us for this tour, your Early Bird can be refunded or transferred to another tour. Take a few minutes to peruse this itinerary. The beauty of Colorado is inspirational. Its Old West ambiance and vintage train transport takes us back to a simpler time. And, as always, walking is the special ingredient for connecting with the intriguing history, culture, and scenery of this Rocky Mountain state! In the end, we think you will agree that walking is still and always the best way to experience our world. Give us a call and talk to one of our Adventure Consultants about how to join us for this unforgettable Walking Adventure program! Look at this adventure I found on walkingadventures.com!